Discussion in 'Made with GameMaker' started by sitebender, Oct 23, 2018. I had the weekend off, and I chose to use it the only way I know how and that's make a quick game. At first it started as simple art, because I wanted to make art. Then it turned into a simple game jam sort of thing. This project helps me get better at art. 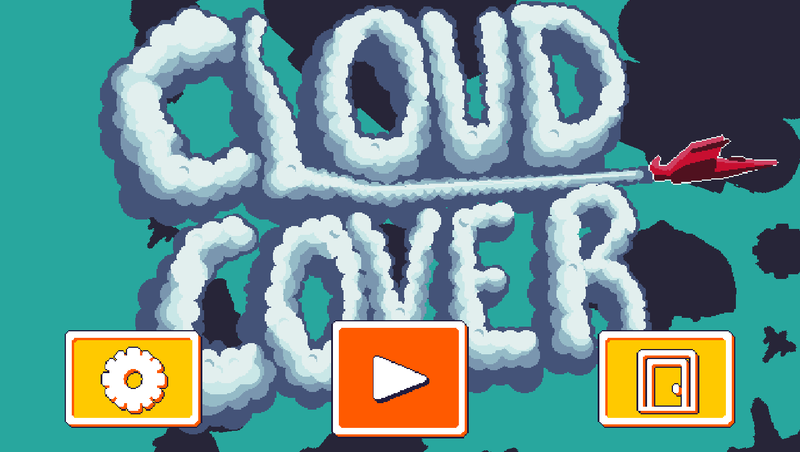 Cloud Cover is a simple shmup with limited movement, as in you can only move left and right, but you get a dash to move in an instant to the left or the right. With this being my fourth shmup, I had to make it different, so this is the difference. There are no traditional levels, instead enemies drop randomly until you destroy enough of them to get to the next level. It takes about 10 minutes to see all the content. Then the game loops infinitely. - 10+ items to collect including weapons, magnets, bombs, points, health, and lives. - 10+ enemies and 5 bosses. - 7+ selectable ships to pilot, each with their own stats. - 20+ selectable pilots with their own perks, pros and cons. Edwin, IndianaBones, Amon and 2 others like this. The game looks amazing and of this was made in a weekend I need to take my hat off 'cause the overall feeling and graphics are great! Looks like an old classic game: Simple looking but smooth,consistent art and nice feeling. Thanks for the compliments. They mean more now that I'm the person who did the art. I spent yesterday working on more bosses and enemies. The game used to drop a random pickup every 5 enemies, but now the game will spawn a carrier enemy with a mounted turret to drop the pickups. Player needs to destroy the turret, then the enemy itself to earn the pickup. So in a way it's a lateral movement, as you still need to kill an enemy for a drop. 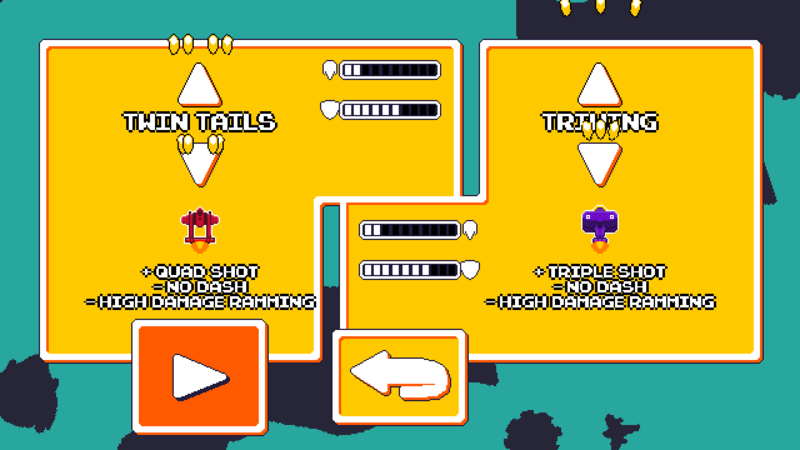 It's still a basic shmup, but I added 2 weapon pickups that will give the player a dual or a triple shot. These extra weapons have a 10 second limit, otherwise the game gets to be far too easy. Plus, the other power ups / pick ups have the same 10 second time limit. If there's a logistical question behind a timed weapon vs a weapon with ammunition, the game lets you juggle a pickup without collecting it, so there you go. If the player already has a weapon and they get a new weapon, that's an extra bonus. As for the subtlety, the player can now fire a triple shot if they don't shoot for a fourth of a second. 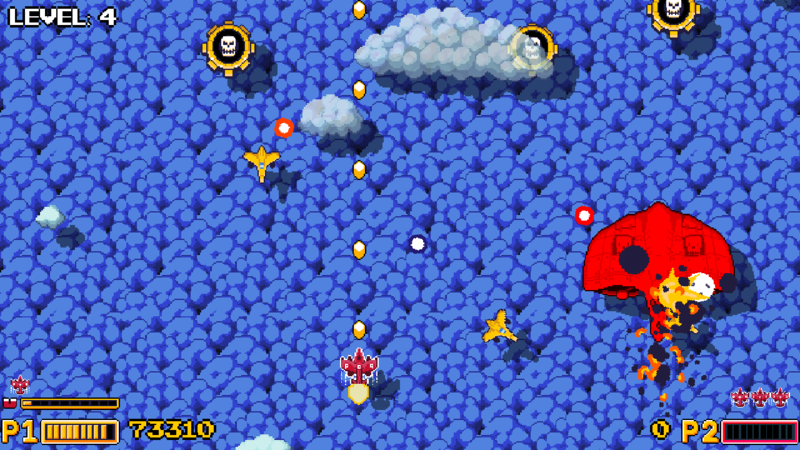 That will make the game a bit easier to get the faster enemies and get the big foes that slowly fly by. Before this update, each level was completed by killing 10 enemies or a boss. This made the game go by fast. I could see both bosses within 6+ minutes. While the game is infinite, it's probably best to stagger the content a bit more. So now each level requires the player to kill more enemies, until each level maxes out at having to kill 30 enemies. At first it was having to kill 10 more enemies per level, but having to kill 60 enemies at level 6 felt like far too much of a chore. Even having a maximum of 50 enemies per level felt like too much of a chore and if it's that bad with me playing it, it will be worse with anyone else playing. So I went with a maximum of 30. Perhaps 2 players will be double that, but I will know that when I add the main menu and let there be a second player. I am still on track for wrapping up the game within the next week. Now, this looks awesome. The art is brilliant. Thanks for the compliments. Art and style makes it all come together. I've moved into my 2 hours a day phase of the project and made a menu for it. 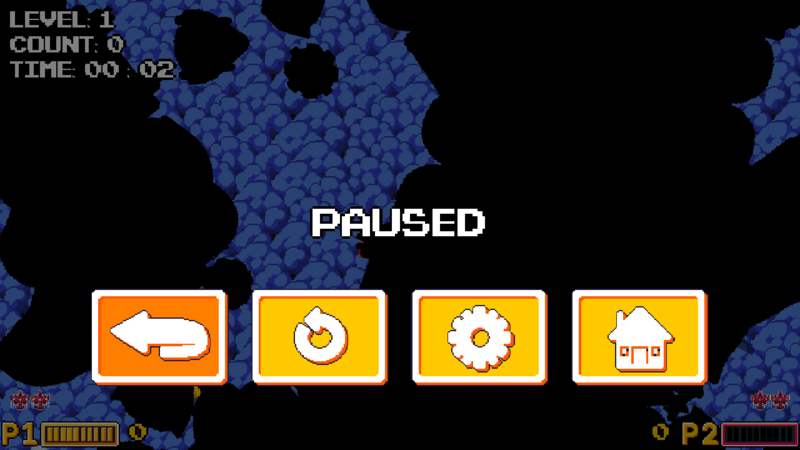 There's a title screen menu with no title on the screen, a pause menu and a game over menu. 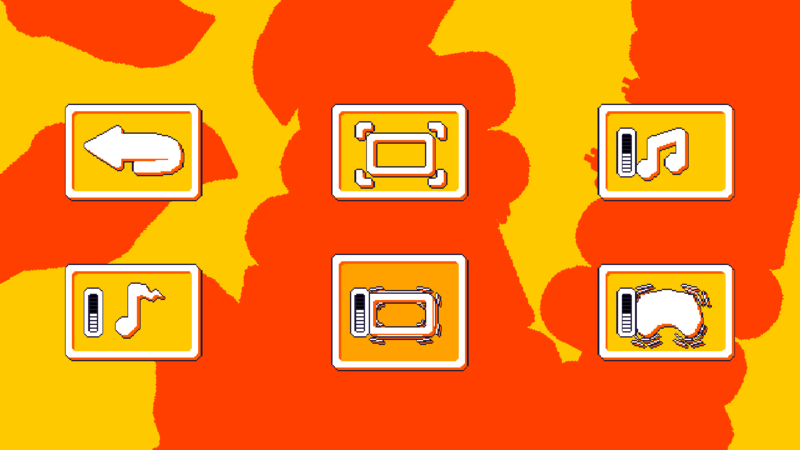 Hopefully these icons should be self explanatory. Please let me know if they are not. This pause screen looked a little dull as my pause screens always do... so I added a system to make enemy silhouettes fall, drop and float on by. When the game is unpaused, they all shrink and disappear. The player is given 3 seconds before the game is active. This should give the player a better chance of survival to think about things. I still need to setup a menu for the settings, game difficulty and the amount of players. I really like the long explosion effects! Yesterday's session created the settings menu, along with a more elaborate game over, a game save system, a game load system, and keeping track of the high score. The settings are simple, sound volume, music volume, full screen toggle, screen shake and controller rumble. Not that the game has music, sound or controller rumble at this point, but the ground work for each has been laid. Music and sound come last for my games, because I try to make the games feel good before they have audio frills. 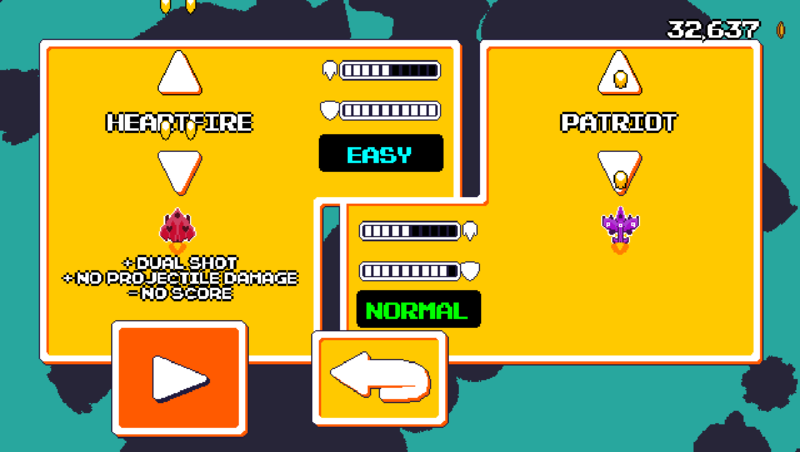 I added more style to the menu itself as now it's yellow with orange rather than transparent with black. With the high score, I made the game show the previous high score when you get a game over. That was a big thing about one of my previous games, people enjoyed seeing the previous high score so they knew by how much their own score had beaten it. 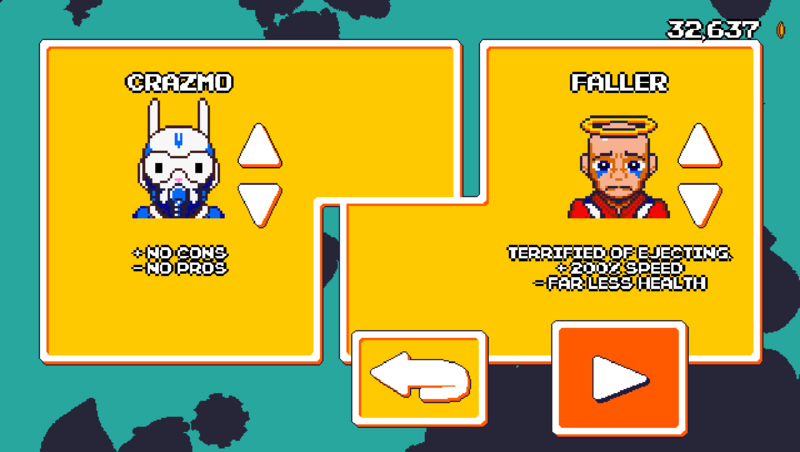 The next steps should be adding menus for 2 player configurations, a difficulty menu, and making art for a title screen. I've had the art in mind for a while now, but will I be good enough to make it look good? I hope this all can be done in a day. What would you prefer more of? To my surprise, I was able to finish all that I intended to yesterday. 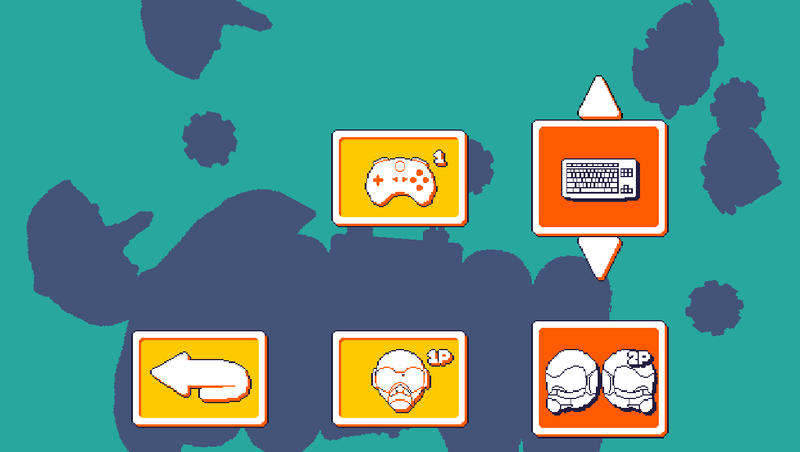 - 2 player menu + input method selection. - 3 difficulties. I thought about 5, but eh no one will play more than one difficulty anyway. The title screen took the lion's share of the session yesterday. It was a dull session. In game, the logo bobs up and down. It's perhaps too big for the yellow buttons below it, but making the logo smaller on the title screen feels unimpressive. To make the title screen less ugly that having a yellow background with red orange silhouettes, I modified things to be aqua with purple. This took the bulk of the actual programming time. The game detects the controllers you have and you assign who uses what. Player 1 can be on the right side of the keyboard, player 2 on the left. Player 1 can have the second controller and player 2 can have the full keyboard. It's nice and hopefully self explanatory. Having two players makes the game far easier, so to beef it up, the players now have to destroy twice the enemies before the next level. That way both players have a chance to kill the same amount of enemies. I will spare you the difficulty selection screen as it's simple. 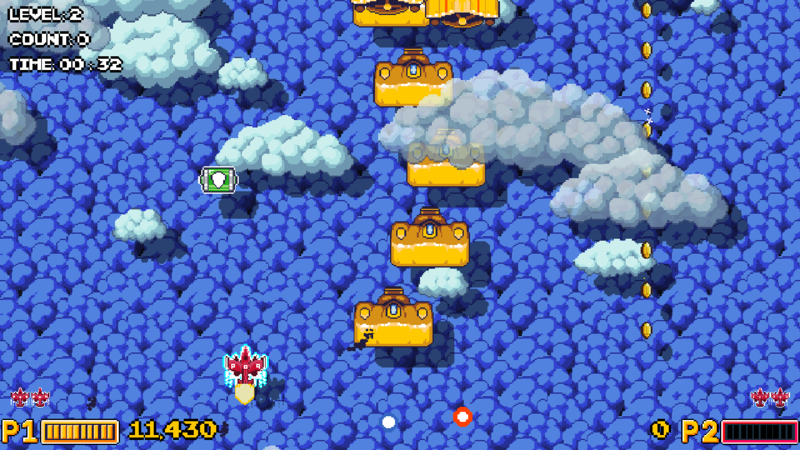 The three difficulties start the player off with less lives, the player takes more damage, the items are dropped less. From 5 enemies killed to drop an item to 15 enemies killed to drop items. 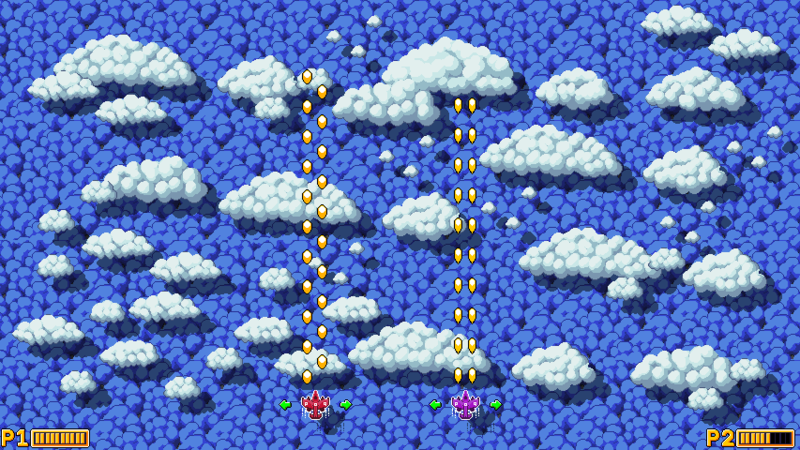 Since the harder difficulty is so much more of a handicap, the players are rewarded with bonus multipliers at the end of the game. 1x for easy, 3x for medium, and 5x for hard. Even if on the hard difficulty I fail to reach the same place when I get a game over on easy, my final score is far greater than it would be on easy. Looking smooth so far. Is that water under the clouds of your title screen or more sky? That is just art and colors. Neither water or sky. The menu was a little dull having just a dimmed background of what is in the game, so I made enemy silhouettes fall. Then that looked ugly with the dimmed background of what's in the game. So now it's just a color. Due to social functions, I am and will be unable to work this weekend on the game... so I'm just kicking it out the door. Game in 9 days. Hopefully I get more feedback on this than the last game. Rishky and IndianaBones like this. - Added control instructions for keyboard and controller. - Added player outline when the mini charge is charged 1/4th of a second. - Added background scroll speed setting. So you can make it scroll fast or not scroll at all. - Fixed music volume setting not adjusting the music volume of the active song. The game jam is over, but the game still continues. The last session or two felt productive. During the game jam last week, I did start the art of three bosses that were never added to the game due to time constraints. I finished up one of the bosses, gave it a basic animation and added it to the game. The boss that was sitting around was added to the game. It sits on top of the airborne aircraft carrier and belches bullets. Two more bosses to go... a giant slug and some mega winged boss. With the third boss and the fact that I can barely make it past level 10 of an infinite level game, I modified the bosses to happen once every 3 levels. So, enemy level, enemy level, boss. This replaces the previous boss on every fifth level. This makes the game feel faster like there's more progress, while still letting the player see all 3 bosses without having to be all that good. The game had six or so enemies, but I made art for three more and dumped them into game in the later levels. Well one enemy appears in all levels after the first. Having three new enemies adds more content and dynamics to the game. So now I feel like there's enough intense combat and original enemies for 10 minutes rather than 5 minutes. This enemy comes in chains of 10 and is designed to restrict the player. If the player rams an enemy, the player takes far more damage than a mere bullet. The player can still get in front of the chain to kill the pushers, but there's a catch. It's risk reward, how many can you kill before you need to move? Each kill gets you that much further to the next level, so standing in front of a chain of 10 can get you up to 30 kills for that next level real quick. Marked with a skull, it will appear quick and bluntly ram forward. They aren't really an enemy to kill so much as an enemy to dodge. You can kill them and possibly get hit trying. There are bigger weapons and 2 players, that might work out better to actually kill them. Why have one shotgun when you can have two? 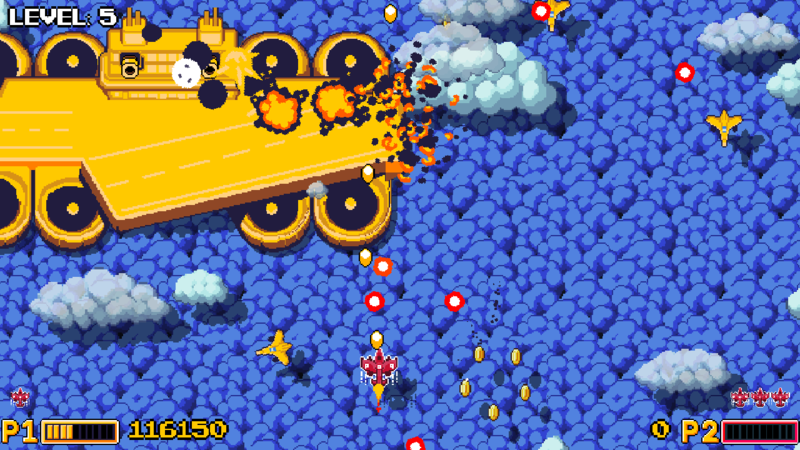 This broad winged beast requires the player to destroy both cannons before obliterating the body. There's a nice effect when the cannons are destroyed that involves fire and smoke. As for why it's the called shotgunner... it fires clusters of bullets at a wide spread. It is perhaps the most delicate enemy to destroy that should be destroyed. I really like the iconography. I navigated through the money withouth the need of the word. That was cool. The color pallet is also interesting but, right out of the bat I had a problem and it's the background. It makes me dizzy and it's really hard to see with it. There is so much noise on the screen that it becomes hard to see what is a bullet and what is not. The movement felt painfully slow and it's limited to just the horizontal axis. Dodging felt more like a luck game of being properly positioned rather than skilluly moving away. It's not really satisfying. The "WARNING" message stood on the screen so long there were enemies under it and I couldn't see them coming towards me. For the sake of diversity, I started adding more playable vessels with a way to select them after selecting the difficulty. It's becoming quite a process to start the game with having to select the amount of players, their control schemes, then difficulty, then the player selection. The new playable vessels have a variety of shooting speeds, projectiles, alternate weapons, dash or no dash, speeds, firing patterns, attack damage and defenses when shot. Oh and sizes, they all have different sizes. This also helps with one of the testers preferring a quicker vehicle without having to remake the game based on the fact the player is so quick they can dodge most anything. Just crank down the defenses and boom, a balanced vessel. The default Patriot ship has moderate attack damage, the highest defense possible, fires a straight forward pattern and has an alternate triple shot. The Belcher have weak projectiles, but fire more of them. The alternate fire is a wide shotgun spread, but has limited range. The shotgun can take out bigger enemies to the side, while other vessels would have to let enemies pass by. The downside is there's no dash, so you'd need to weave between bullets. 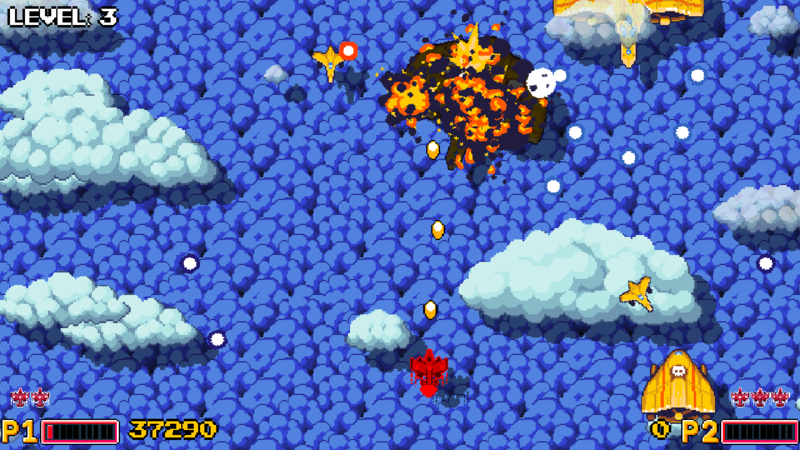 Based on the attack strength and speed, enemies that used to restrict the screen become a smorgasbord of destruction. This allows certain vessels to burn through the levels at the cost of less defense. Not to double post or anything, but you wrote while I was writing the update. Thanks for playing and the feedback! The red things are the bullets. You can stop the background scroll in the settings. The player movement is slow when shooting. You can stop shooting move faster. Plus there is a dash if you need to dodge some bullets. 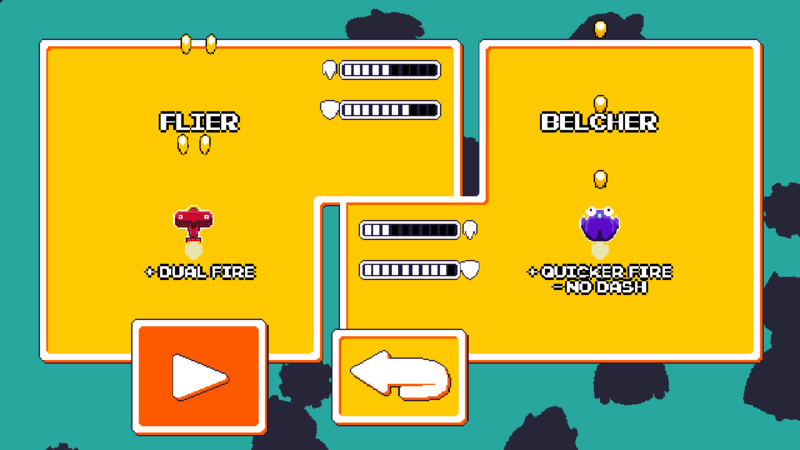 To quell the player speed, the new version has different playable vessels. I had indeed toned down the scrolling through the setting, but are the many elements contrasted with the patterned cloud background that makes it hard to read the bullet positions sometimes. I played again and you are right, you move faster when not shooting, but the difference is quite small and I hadn't noticed before until you pointed it out. I think the mechanic is interesting and makes it so the player can't be just holding the shoot key, however the small speed difference didn't stop me from holding it. I didn't know about the dash, but after experimenting with it, while it's indeed faster than the normal movement (while not shooting) it seems to have a fixed length and I often rammed into other incoming projectiles or ships (not that it's a bad thing, it could be the payback, but it still wasn't a viable dodge option to me). Yeah there's a lot of on screen fluff that most shmup players would condemn since the bullets can get partially obscured by clouds and the clouds are fast. I tried something new with this and it failed. I wanted to give the game a sense of speed since this is my fourth shmup and the others have very slow backgrounds without any obscuring elements. With this being my fourth shmup, I stapled the player to a Y axis rather than full movement. Good thing you have a lot of health to get better at dodging those bullets. The speed doubles when you aren't shooting, but I suppose if the speed isn't very fast for precision already, double the speed won't be helpful then. On the plus side, there is a new, faster ship with less defense. The dash is a fixed length yes. It's more so to get out of the way of projectiles. My first shmup had a dash that was infinite so the player could literally do circles around enemies... but if the player hit them the player would explode and die. Again, thank you for playing. I'll do some more tweaking based on your feedback and feedback from the game jam judges which was harsh at the time. "In an era where we have controllers with two thumbsticks, why does this game only shoot forward?" Maybe the ships can move faster but they have acceleration and decceleration, that way if I lightly tap I can do fine motor movements and if I hold I move at a fast speed. 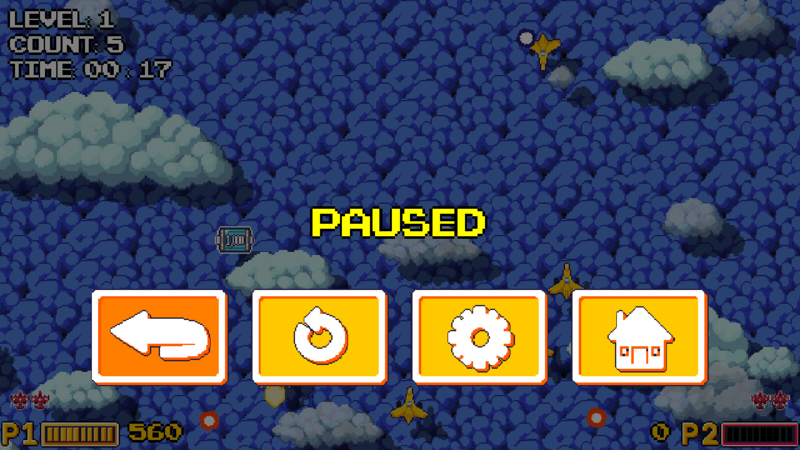 The dash could be canceled if I stop pressing the key, but I have to wait before I can use it again, that way players won't keep using it constantly. Alternatively when the player dashes the ship is invincible and takes no damage, however it takes a while for the dash to reload. - Added a second speed where if the player is moving left or right for half a second, the extra speed turns on. This gives the player precision with small movements and necessary long range speed. 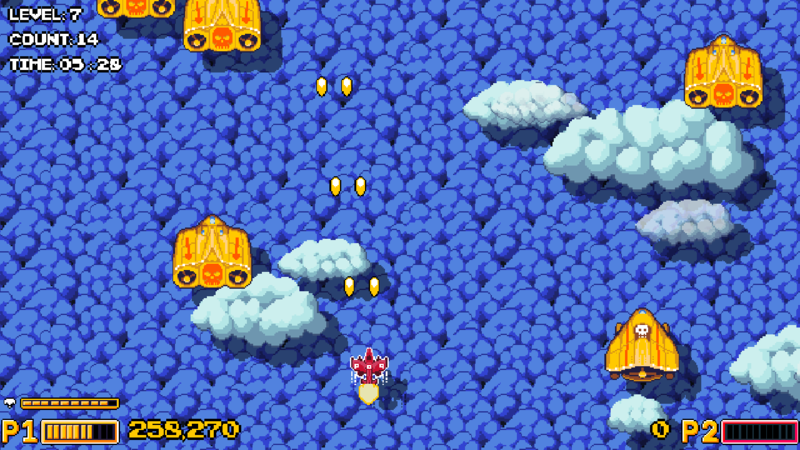 The extra speed also prevents momentum sliding, as that was a big complaint from testers in previous shmups. They'd end up sliding into bullets and didn't like the icy feel. With the new speed, it makes the alternate triple shot a bit obsolete. - Modified the dash to wipe bullets without taking damage. If the player dashes into an enemy, the player still takes damage. This does make the game considerably easier, and the player can plan out to wipe bullets with a dash for points. The points stack / combo. 100 points for wiping one bullet, 200 for the next, 300 after that and so on. There is now a maximum time of a third of a second rather than a fourth of a second. Half a second or longer felt like I could greatly abuse it to the point where bullets were no longer any threat. Plus, when a dash stops, you can just dash again, but you have a split second to still take damage. - Modified shield to stack points as well for getting hit by projectiles. The shield always gave the player points for getting shot, but now there are more points! Points now stack in hundreds rather than tens. 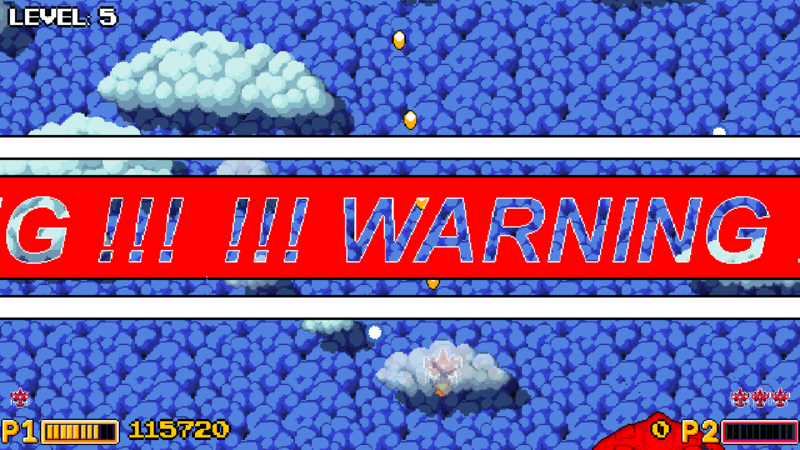 - Modified the warning to be up higher toward the top of the screen so the player can see more of the lower half and any bullets coming at them. There is also 25% transparency. - Added a body damage stat to the vessels from ramming enemies. Default is 5 damage. The Flier takes 8 damage and the Belcher takes 1, as it's bigger and weird like that. There is so much explanation that I should dump it into a manual. A few fixes and two new enemies highlight the latest update. The two new enemies make up for more variety and now the player might take 12+ minutes to see everything in game. Who knew that dumping enemies into a game with no real levels could be such fun? Since the player can now dash for longer, it was time to create an enemy that would make use of it. Laser Mouth is just an enemy that scrolls across the screen with a giant laser that never stops. The player can dash right through the laser to not get hit, but for the vessels without a dash, the foe can be carefully destroyed. Laser mouths appear every 45 seconds after level 3. The trishots have an unimpressive size, but they are quick and pack faster bullets. The twist here is the enemy flies to the player's face, shoots one, two, three rather than all at once. The three shots have a set trajectory and the projectiles are faster. The first shot is away from the player, the second shot is forward and the third shot is toward the player. The trishots have low health, but they collect in numbers. - Fixed the title screen getting paused after a game over. This was only visible when the player would select vessels. - Fixed music not playing or playing incorrectly. 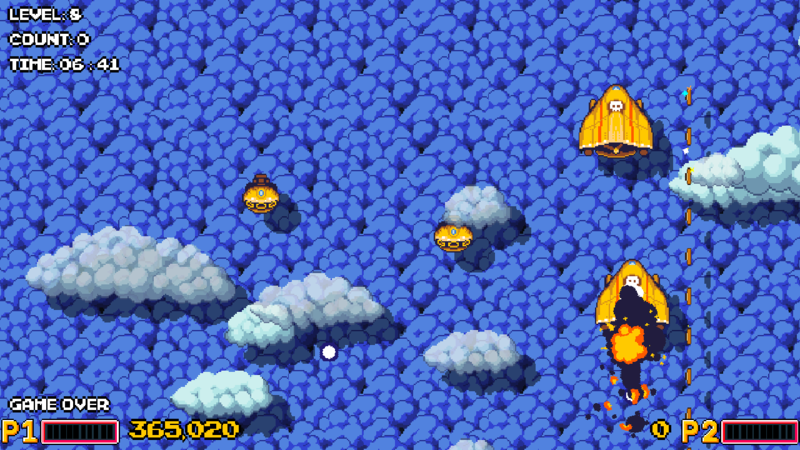 - Fixed bombs being able to sail the player through entire levels with a single bomb. - Fixed a crash at level 10. After two weeks, I am just declaring this project done. It's a week after the end of the game jam. It has been almost a week since I worked on the game since I am content with it as is. 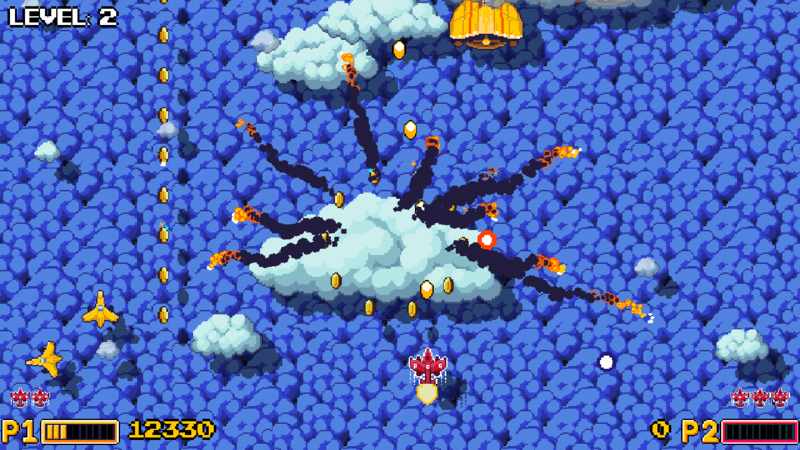 Since someone new played it, I had a chance to improve the game with certain shmup standards such as now the bullets are always over clouds and explosions. This should be true of any shmup, but wanting to make this game different from my other shmups, I tried to obscure bullets behind clouds. I also felt like the bullets were patterned enough to be predictable. The explosions now have a setting to reduce or increase their transparency. This increases the player's visibility to their liking. Beyond that there are two new playable ships, raising the total to seven. These two new ships bring the most bullets, but the least damage. Then again, more bullets, slightly more damage, so it balances out. While they have similar stats, the amount of bullets alone should make them discernibly different. The final news to report is there is a later enemy in the game that amounts to a small octopus that blasts big laser beams. The octo will blast one, then hop, blast another, then hop. 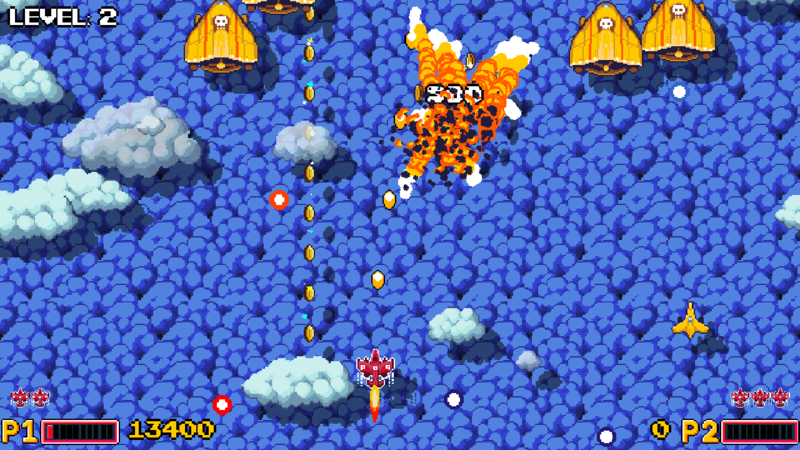 All the way up to three blasts, before it jets past the player. They are easy to dispatch as they have a giant dome to shoot and low health. 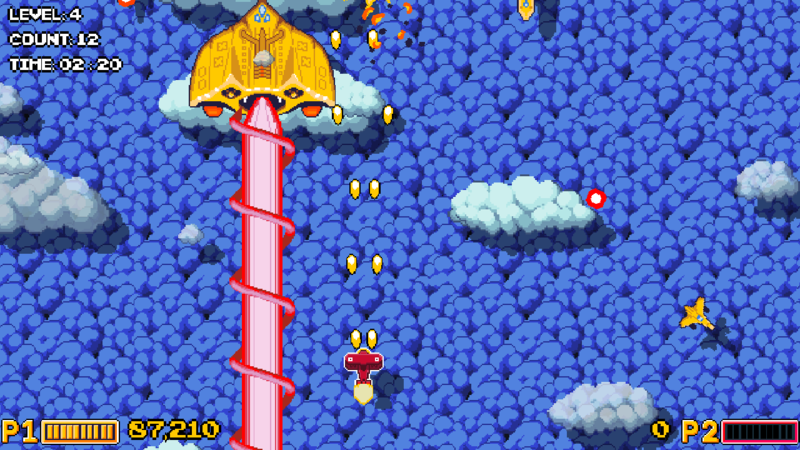 The long lasers will restrict the player, even if the player can dash through them. - Added a new enemy for the later stages. - Added 2 new playable vessels. - Added automatic anti-aliasing and V-sync to full screen to prevent screen tearing and rippling. - Added a smoke transparency setting. - Modified bullets and projectiles to always be over explosions. In this update, there are quite a few things that people requested in the past. Things like the icons are good and self explanatory, but some still wanted text above the icons. Another request was for more explanation, so instead of a simple help, there is an entire manual. The menu has support for the gamepad's analog stick. This update is to hammock the gap between the last one and a much bigger update that will come out at a later date that will involve more graphics, enemies and a mission mode that will be different from the infinite mode that makes up Cloud Cover. - Added analog support in menus. - Added left and right hand only controller support for those who only have the use of one or the other. - Added new super weapon. - Fixed crashes related to smashers instantly killing improper things. - Modified smashers to now count the enemies they destroy. - Added another easy ship for beginners that will regenerate health if you go untouched for 10 seconds. - Added skills for more pilots. - Added text over menu icons so people understand what things do. - Added achievement system because it was laying around. Achievements are very basic. - Added player pointers for the first 3 seconds of the player's spawn. - Added avatar variants so they can blink or have more expression. - Added mouse functionality for menu buttons. - Modified the font to be fatter. - Added a version number. It is tough to figure out a version since this game keeps getting added to after a game jam.